Garda Headquarters has said a malfunction in a security system damaged the car the Commissioner was travelling in two weeks ago as he was returning to his office in the Phoenix Park. Drew Harris was being driven by armed PSNI officers in a PSNI jeep and was escorted back to Dublin from Northern Ireland as part of a joint Garda PSNI convoy. 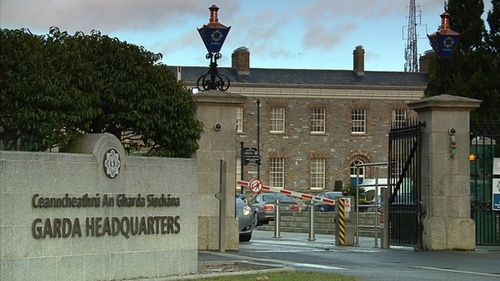 The Garda's Emergency Response Unit car successfully drove into Garda Headquarters but gardaí now say "a newly installed bollard malfunctioned and caught the underside of the vehicle the Commissioner was travelling in". In a statement issued on behalf of Commissioner Harris this afternoon, gardaí now say there was no security incident at Garda Headquarters on 25 March last, that the PSNI jeep was travelling "at walking pace" and "no vehicles were flipped". The statement also says that the malfunction was quickly fixed and traffic went in and out of Garda Headquarters as normal that day. Gardaí have also reiterated that normal procedures were followed and that where An Garda Síochána and the PSNI carry out any operational activity in either jurisdiction it is within the law and with the full permission and knowledge of the host.